For me stealthing in my Prius is the act of not being seen as out of place, and to cause further inspection by the public. The concept of stealthing in a vehicle is often debated in online forums for its definition and if it can be 100% achieved. I have stayed overnight in parking lots and street side in a legal parking spot and have stealthed, but how do you know you are stealthing? This is one adventure where I was totally unnoticed. As usual I picked a spot for the night in a well used parking lot not designed for overnight stay. I always have a back up location or two just incase my choice doesn't work out. I had not stayed here before. I parked just after dusk and slid myself into the backseat of the Prius so not to be noticed getting out and back into the rear seat using the doors. The parking lot has security cameras. I backed in to a spot with a small curbed area to my left separating the next parking spot to that side. The right side there was a car. I am now in bed in this parking lot that is well lit, but the tint on my windows and black curtains make my interior look black from the outside. This setup let's in enough light to see what I'm doing inside with out having to use a light that can be noticed from the outside. The people came to the car to the right and got in next to my car and left. No one has ever noticed me in my Prius travels with this setup that I know of. I thought I was good for the night when I hear running footsteps on the asphalt and men yelling that they were going to get another person. I look out and see the man being chased get into the car to my right now with one vacant spot between us. 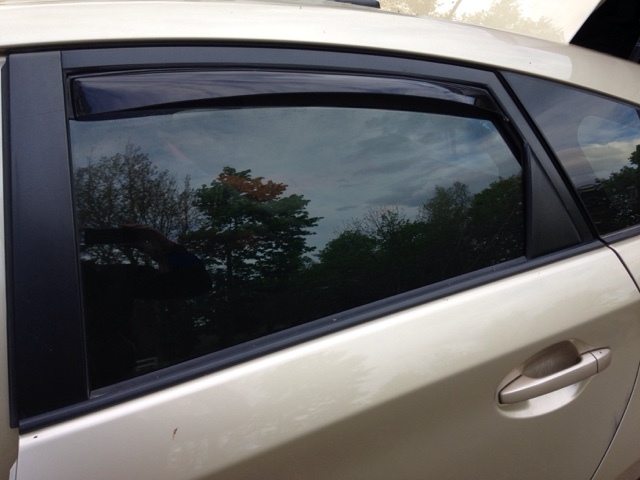 My rear windows are cracked for airflow but the rain guards do not show they are open. There were two additional men chasing the first and started beating on the now locked car with the first guy in it. They continued to yell. This yelling attracted the parking lot security who came and stopped the commotion. Then 2 cruisers show up with local police, apparently called by the security guy. The police were standing with their backs a few inches from my car door. After the police running the guys in their computer and finding out it was just 3 stupid guys horsing around everyone left. Here I was within inches of all this and was never detected and had a good nights sleep after everyone left. When security showed up I turned off the electronics not to show light and left my compressor fridge on powered by my house battery. There is a light him inside when it runs but I don't hear it on the outside of the car. I was blending as I normally do, but this is the first time i had this active situation for 30 minutes around my Prius and my stealthing design actually worked. In the morning I'm up and gone by sunrise, sliding back into my Prius front seat and on my way to McDonalds for unsweetened iced tea, yogurt, and wifi for podcast downloads. I don't use the same parking for nearly another week. The Prius is great as it just blends in as long as you have the right setup and don't move around when people are nearby.